The structural flaw in those ancient stone homes is not so different from unreinforced brick buildings built in California before 1933. 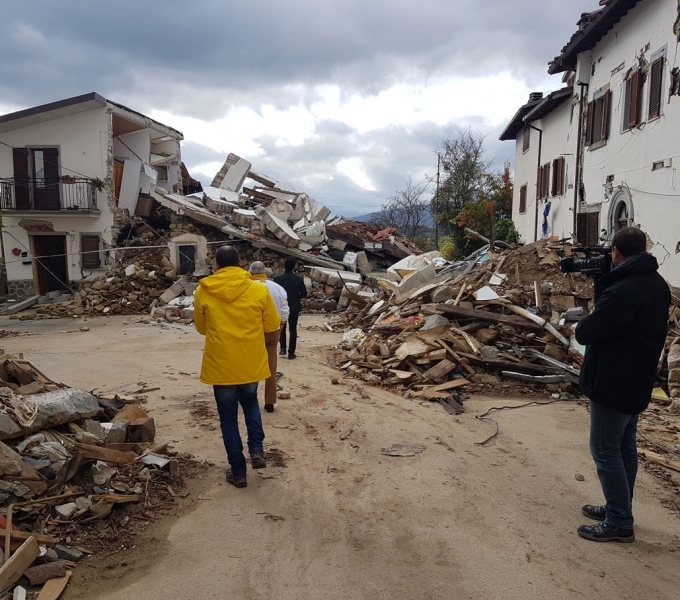 (TNS) – Surveying the devastation of centuries-old villages pummeled by a major earthquake in central Italy this week, it’s easy for Californians to think that the more modern buildings here would better survive the shaking. The Long Beach quake shares several similarities to this week’s temblor in Italy. It was slightly more powerful, estimated at magnitude 6.4, and like this week’s temblor was shallow, meaning the shaking was particularly strong at ground level. The shaking in Long Beach turned the mortar between bricks back into sand. With nothing tying the walls to the roof, bricks shot out from walls like cannonballs, and roofs came crashing down. Numerous office buildings, stores and schools collapsed. The devastation began decades of earthquake safety measures in California, including a ban on new brick buildings that have not been reinforced. Some cities, including Los Angeles and San Francisco, forced property owners to retrofit or demolish existing unreinforced masonry structures. But thousands remain. Officials have expressed particular concern about cities including San Bernardino and Bakersfield, where there are clusters of these buildings and no retrofitting requirement. In central Italy, the quake also damaged brittle concrete buildings built in the 1960s and 1970s, Gian Michele Calvi, structural design professor at the Institute for Advanced Study of Pavia, said Thursday in a telephone interview. Hundreds of similar buildings — mostly unretrofitted — exist across California. But the lion’s share of casualties in Italy are believed to have been people trapped in the rubble of unreinforced stone homes that date back to medieval times, Calvi said. Brick and brittle concrete buildings have been the focus of much debate in recent years. Los Angeles last year passed the nation’s toughest earthquake safety rules, requiring retrofitting of brittle concrete buildings, and San Francisco is studying similar rules. There has also been a push in some areas to deal with vulnerable brick buildings after recent California quakes highlighted the dangers. After the 2014 Napa earthquake, South Pasadena began to study its seismic vulnerabilities. The results were disturbing: Out of 60 brick buildings, 27 were still not retrofitted. Signs were not posted warning about the earthquake risk. Last week, the South Pasadena City Council voted 4-0 to require the rest of them to be fixed, giving owners a deadline of 21/2 years once they receive a new order to comply. The affected buildings include commercial and multi-unit residential structures. Retrofitting a brick building is relatively inexpensive. The basic approach involves pushing steel rods to affix the brick wall to the building’s ceilings and floors. More extensive versions involve installing diagonal braces or adding reinforced concrete or polymers to the walls. “You basically have four walls being held up by the weight of the roof, so when they shake, there’s nothing to keep them together,” Gonzalez said. “The reinforcement allows people enough time to get out safely” once the shaking has stopped. Concrete buildings are generally much larger than brick ones. They can cost more than $1 million to fix, making them far more expensive. The earthquake struck Italy at perhaps the worst possible time — the late summer season, when children from the city are sent up to their grandparents’ ancestral homes in the mountains, filling residences that are usually empty. The region has only 5,000 or so residents, but is now filled with tens of thousands of visitors. Amatrice this weekend was to hold its annual festival for its namesake signature pasta, spaghetti all’amatriciana. It wasn’t just homes that are gone. A hospital collapsed, and buildings for police and firefighters were ruined, Calvi said. In one town, there was not a single building safe enough to set up an emergency command post, so officials were forced to set one up in the town square, Calvi said. “In a high seismicity zone, this is really unbelievable,” Calvi said. He said lawmakers have considered, but never acted on, reforms to convince owners to retrofit these quake-vulnerable buildings. Calvi said there is not much motivation for owners to retrofit. “This is a problem related to the fact that politicians have not really paid attention,” Calvi said. That’s because the town was struck by a moderate earthquake in 1997, and money poured in to strengthen structures. The Italy earthquake is similar to the kinds of earthquakes seen in California. Even a magnitude 6 earthquake can cause severe damage if it’s shallow, and hits directly underneath a populated area. “It was kind of a perfect storm, locally,” said USGS seismologist Susan Hough. Italy’s earthquake struck only six miles deep. By contrast, a magnitude 6.8 earthquake that struck Myanmar, also on Wednesday, was more than eight times deeper and caused far less damage and deaths. Other shallow earthquakes have walloped California in the past, such as the 5.9 Whittier Narrows earthquake of 1987, which severely damaged brick buildings in Pasadena, Alhambra and Whittier. Even worse was that many of the Italian villages were at the tops of mountains. “Mountains sort of behave like a loudspeaker,” said California Institute of Technology mechanical and civil engineering professor Domniki Asimaki. As seismic waves move up to the peak, the earthquake energy is funneled into a smaller space, making the shaking worse at the very top. The principle was confirmed in USGS helicopter observations of villages after last year’s 7.8 earthquake in Nepal. “Some of those villages built at the tops of those mountains, the structures almost appear to have exploded,” Asimaki said. Knowing that earthquakes are a fact of life should be a warning for those in Italy and in California. ←In Wake of Quake, How Ready is Los Angeles?